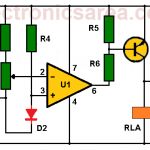 The Differential Temperature Controller circuit measures the temperature difference between two sensors and activates a relay when the temperature is not the same. It is also possible to detect a temperature change, even when the two measured temperatures are normally different. 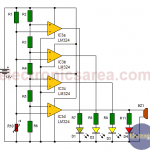 How the Differential Temperature Controller works? 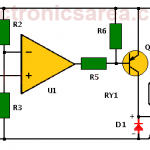 To implement this circuit we use two common semiconductor diodes (D1 and D2), as temperature sensors. The diodes anodes are connected to the inputs of the operational amplifier. The op amp works as a comparator and any temperature difference will cause a low voltage level at the comparator’s output. Diodes are placed in two different places sensing the two temperatures we want to compare. If there is a small variation in temperature in any of the two diodes, the voltage at its terminals decreases. If the D1 diode is placed in a location susceptible to a temperature drop, the op amp will have on its output a low voltage level and will activate the relay through the transistor Q1. The transistor may activate a heating system or similar. If the D2 diode is placed on a location susceptible to a temperature rise, the op amp will have on its output a low voltage level and will activate the relay through the transistor Q1. 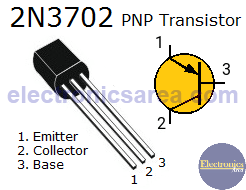 The transistor may activate a refrigeration system or fan. 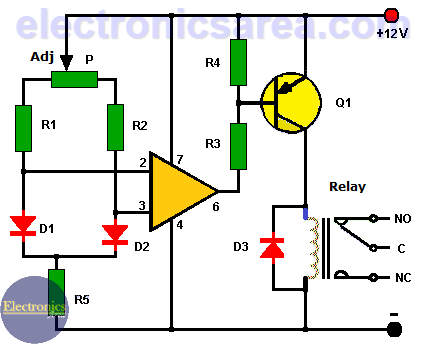 When the temperature on the two diodes is again the same, the relay will be deactivated. Note that the inclusion of the potentiometer may vary the operation of the circuit. Note: The circuit can be powered by a 9V battery. You have to switch the relay by one of the same voltage.